We are happy to end our summer slump on this blog with the presentation of a very unique project which was published on lyrikline.org today. From January to April 2012, poets from all 27 countries of the European Union and the accession country Croatia wrote a chain poem or, as we call it, Renshi to Europe, for the Berlin Poetry Festival. The picture above shows all poets who took part: l.t.r. 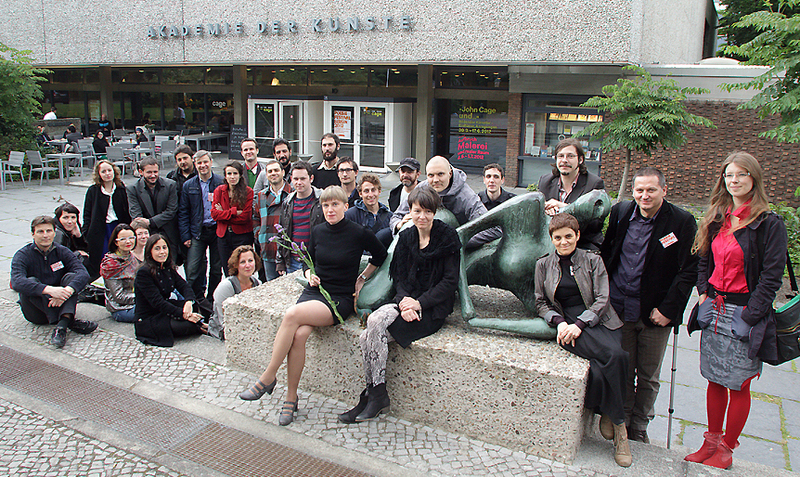 Martin Solotruk (Slovakia), Gabrielė Labanauskaitė (Lithuania), Olga Ravn (Denmark), Claudia Gauci (Malta), Jen Hadfield (United Kingdom), Zoltán Tolvaj (Hungary), Filipa Leal (Portugal), Luigi Nacci (Italy), Tom Reisen (Luxembourg), Gwenaëlle Stubbe (Belgium), Ester Naomi Perquin (Netherlands), Jonáš Hájek (Czech Republic), Sotos Stavrakis (Cyprus), Yannis Stiggas (Greece), Edward O’Dwyer (Ireland), Marko Pogačar (Croatia), Maarja Kangro (Estonia), Gregor Podlogar (Slovenia), Christoph Szalay (Austria), Jean-Baptiste Cabaud (France), Jenny Tunedal (Sweden), Harry Salmenniemi (Finland), Arvis Viguls (Latvia), Josep Pedrals (Spain), Svetlana Cârstean (Romania), Georgi Gospodinov (Bulgaria), Agnieszka Wolny-Hamkało (Poland). Katharina Schultens (Germany) is not on the picture. Greece, as both the focus of the economic crisis and the birthplace of European culture and democracy, was the jumping off point for this Renshi. The Greek poet Yannis Stiggas’s poem was used as the starting point and basis for all five groups. At the end, he also wrote a final verse that reflected on the extant traces of his own lines in the writing of the other authors. lyrikline.org was a cooperation partner of renshi.eu. Many thanks to the partners of the lyrikline.org network who helped to organise this project: Absoluteville / Absolute Poetry, Ars Poetica-International Poetry Festival, Casa Fernando Pessoa, Croatian P.E.N. Centre, Estonian Literature Centre, Institute ramon llull, Koperator – The International Cultural Programme Centre, Latvian Literature Centre, Literature Across Frontiers, Literaturwerkstatt Berlin, Nederlands Letterenfonds / Dutch Foundation for Literature, Nuoren Voiman Liitto / Runokuu Festival, Petöfi Irodalmi Múzeum, Rámus förlag, Romanian Culture Institute Berlin.